It is said that when people see birds flying through the sky, they get the urge to go on a journey. The anime starts out in the middle of Kino’s journey, and while it might seem slow-going or hard to understand at first, the pace picks up after a while. It actually isn’t until Episode 4 that you find out who Kino is and why she is travelling in the first place. 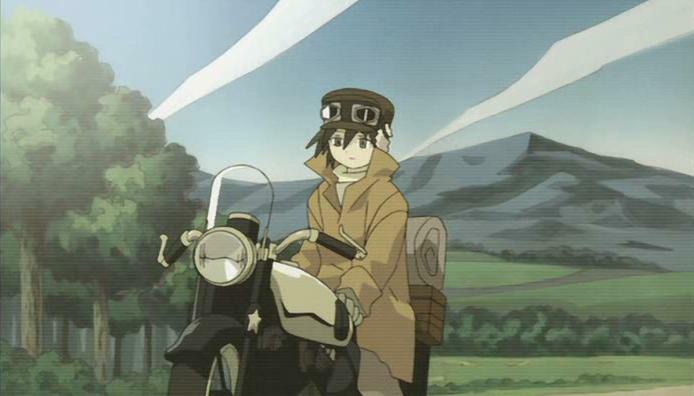 The original title of this anime was Kino’s Journey: The Beautiful World, and the opening song is indeed beautiful. However, the countries that Kino visits often have an ugly side to them. The world itself is a steampunk-style creation with far-flung civilizations of wide-ranging traditions and technologies from the early stages of flight to cities run by robots. In between, there are lonely roads meandering through a scenic countryside of forest and mountain. The background artwork is lovely in its simplicity and muted color tones, reminiscent of traditional Japanese landscape paintings with the look of watercolor on textured paper. The petite protagonist speaks quietly and politely with a rather monotone personality, but she is quick-thinking and has no problem standing up for herself. In fact, Kino often surprises people with her strength and skill in combat. This biker girl packs a lot of weapons and practices her quick draw every morning; however, she only uses violence as a last resort. Although Kino’s intent is to be a neutral observer of the countries that she visits, occasionally she does get involved but it’s usually because she has no choice. The people that Kino runs into can be captivating, strange, crazy, and even dangerous. The dystopian civilizations that she encounters are much like those in science fiction stories. Most of the people in the countries that she visits have no knowledge of any other places outside of their own. Interestingly, the majority are very welcoming to travelers because they rarely see any visitors. But even though these communities may seem pleasant on the surface, they usually have some underlying dark secret or hidden agenda. Kino’s Journey is rather understated for an anime, with more emphasis on atmosphere than plot, although there are plenty of action scenes and most of the storylines contain an unexpected twist. The anime has a surreal, dreamlike feel like a fantasy – but with a darker tone, like the old Grimm brothers’ fairy tales before they were Disneyfied. Just about every episode of Kino’s Journey is unsettling, with some depressing or disturbing elements (a few of which are quite shocking). But your own curiosity about other cultures, if not your concern to see how Kino makes out on her journey, will draw you in and keep you watching. Kino’s Journey is well worth the watch simply because it’s such a unique and timeless anime about the human condition (even if its societal examples are a bit exaggerated). This anime is intelligently written, with Kino visiting museums to learn about the history of places. It’s also philosophical and thought-provoking, using the concept of travel as a means to self-discovery and universal truth. Each episode will leave you with a situation or theme that you can’t help but contemplate further or discuss with a fellow viewer. Interestingly, Kino’s Journey is directed by Ryutaro Nakamura, noted for another psychological masterpiece, Serial Experiments Lain. Kino’s Journey consists of only 13 episodes of 25 minutes each, so you can finish it in just a couple of weeks – or at about five and one-half hours total, over a weekend if you’re so inclined. If you like serious animes, female heroines, cultural studies, firearms, road trips, and/or food for thought – you will enjoy this anime. Start off your summer with an epic anime adventure! Watch Kino’s Journey online FREE with Amazon Prime!